Club that is. I get asked this question all the time. What is a Supper Club? Well it isn't actually a club for one thing but there are criteria for a restaurant to actually be considered a supper club. Over the years the steadfast "rules" have changed however. Usually a traditional supper club is family owned and operated and that is the case with the supper clubs in Door County. Usually, supper clubs are only open for dinner but that isn't always the case. 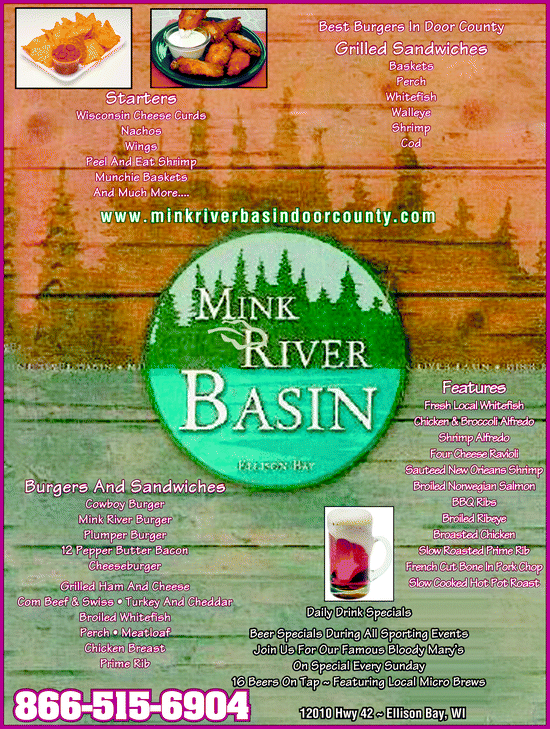 The Mink River Basin in Ellison Bay and The Sister Bay Bowl (fondly known at The Bowl) are both open for lunch. At The Bowl, not only get you get a great steak but you can take in a game of bowling after dinner. Didn't bring your shoes? They have free shoe rental. The Mill Supper Club is a classic example of a Wisconsin supper club. Owned by Don and Shelly Petersilka the the third generation of the family to own and operate the restaurant. From the knotty pine bar to the taxidermy on the walls to their famous chicken dinners, The Mill represents the whole supper club style including an American style menu with steaks, fish, and chicken. Supper Clubs used to have relish trays but those have pretty much gone by the wayside but classic homemade desserts still prevail. The Mill's homemade desserts are to die for. The Nightengale Supper Club known for it's famous Prime Rib and Lobster tail has a large bar another classic feature of a supper club. The owner Dave Ripp also whips up after dinner drinks like Grasshoppers or a Golden Cadillac... now that's a dessert for me. Supper clubs are also know for their classic drinks. Just ask Bob Geitner at Mr. G's Logan Creek Grille (formerly known as Mr. G's Supper Club) Bob serves classic Old Fashioneds, Martinis, Manhattans... you name it. Bob makes Old Fashioneds the old fashioned way... no muddling. To muddle or not to muddle that is the question. If you are familiar with the classic Wisconsin drink it goes something like this... glass, ice, whisky, brandy or southern comfort and bitters. Top with a splash of sweet (7up), sour (50/50) or make it a press, half pop, half club soda. Top that with cherries, pickled mushrooms, brussels sprouts or olive and you'll have my favorite drink. So back to the muddling, the original old fashioned in bar recipe books calls for the bartender to muddle an orange slice, sugar, maraschino cherries and bitters at the bottom of the glass. For most people I know that is just too much work and too much sugar. But hey, if you are a fan muddle to your hearts content. Back in the day no one muddled, now many restaurants do. The Greenwood Supper Club has been in the same family for years so it can be a busy place in the summer and like a lot of restaurants, they don't take reservations. Just find the hostess station and give her your name then sidle up to the big cozy bar and in no time you too will be "member" of a classic Door County Supper Club. Owner Susi Kwaterski Supper clubs are known for their casual, friendly atmosphere where vacationers and locals who are looking for a good fish fry on a Friday night or a stick to your ribs meal... or just a good old fashioned cocktail. For a link to all the Door County Supper Clubs click here.